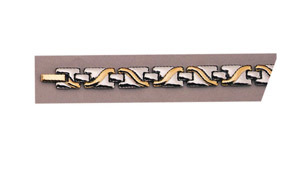 Polished stainless-steel links are embellished with a curved design in polished 24-karat goldplate. Contains five magnets. Measures 7". Click here for enlarged view. Closeout; final sale.